TOM BEDFORD’S move back to Devon in the summer could hardly have gone better. The 27-year-old former Ivybridge Community College pupil joined Albion in June from their opponents today, Esher. Not only has the move worked out well for him off the field, with him and his wife having a new baby earlier in the season and him also landing a new job, but things have also been going well for him on the rugby side. Bedford is one of only four players to have started every league game for Albion so far this term. The others are Nile Dacres, Herbie Stupple and Ethan Ford. 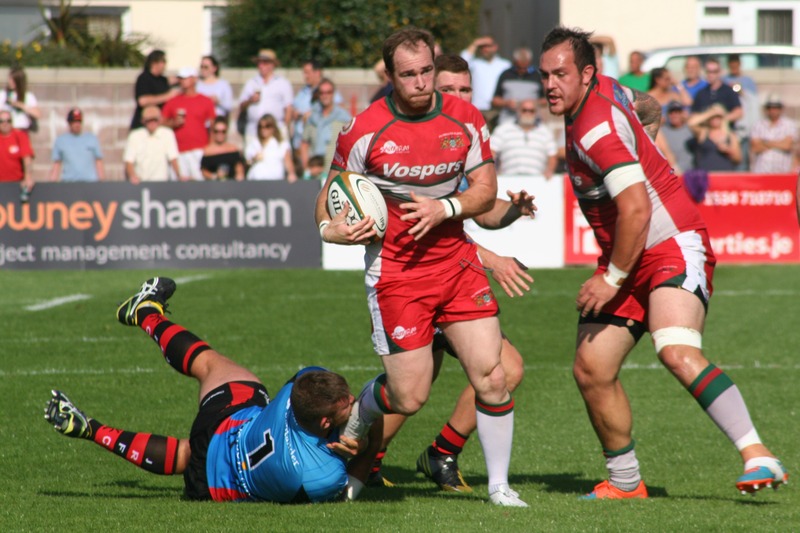 “I have really enjoyed the season so far,” said Bedford, who started his career at Exeter before moving on to Bedford, Newcastle, Cornish Pirates, Ealing and Esher. “As I’ve said before, it is lovely playing again in Devon. My family and friends come to watch me play. “It is also awesome seeing this team grow. At the beginning of the season we were a completely new side, but as each game goes on we are learning and as a team we are growing on and off the field. “Everyone in the squad gets on. We have got a really good bunch of boys, we are all keen and here to learn and we are getting challenged every week, which is the best thing. “In coaching during the week we are getting challenged with new ideas and I think that is what keeps us on our edge. On his own achievement of starting every match, Bedford, one of only a handful of over-25 year-olds in Albion’s squad, said: “Touch wood, I have not got injured and have managed to play quite a bit of rugby this year, which is really nice. “Obviously, selection is up to Graham, but I like to think I bring some experience and maybe Graham thinks the team needs it. Albion take on Esher today at Molesey Road knowing they could leapfrog above their fourth-placed opponents if they were to win and deny their hosts a bonus point. Bedford said: “We have managed to squeeze our way back up the top end of the table, which is nice, and Esher have had a good year. They are flying high and getting some good results. They have got a good team, a good coaching staff, so it is going to be a tough game. Albion’s young team got a real lesson from Esher at the start of October when the Surrey side 38-12 at Brickfields. “I think at home to Esher was one of our worst games of the season – not necessarily with the way we played – we did play poorly – but it just hit us quite hard as a team. Fans weren’t happy, which was far enough, and it did hit us for six really. Albion have got an impressive away record this season, winning six of their nine games on their travels. Their last away defeat came against Blackheath on November 21. “We seem to enjoy our away trips,” said Bedford. “It is nice to go away with the lads. We have good fun on the bus. It is something I think all sportsmen enjoy.